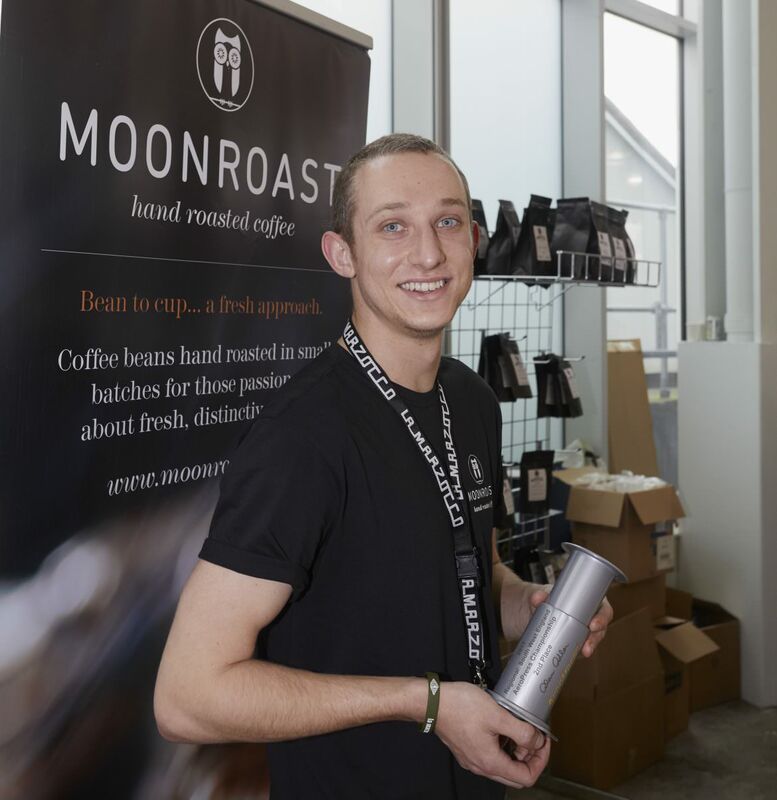 Dan Beaver is not only an award-winning barista but also assistant roaster at Moonroast in Hampshire. He has worked in coffee shops and trained as a barista in New Zealand and now does barista training for the company’s customers. How did you get started in the world of coffee? A couple years ago, I decided to quit my job as a waiter and go travelling and working around New Zealand for a year. I’ve always worked in restaurants, both back and front of house, so felt like a change. I wanted to work in cafes in NZ but didn’t have any previous coffee experience, so I did a professional barista course when I arrived in Auckland at Espresso Coffee School to give me an understanding what coffee entails, and fell in love straight away. I landed a job as a cafe assistant where I learnt great skills from some talented baristas. Yes, I was in Wellington, NZ. I tried a single origin long black from Flight Coffee roasters, which was my first noticeably great cup. I thought if only I could replicate that sweet and pleasant wholesome aftertaste I would be on to something. In May entered the South West England AeroPress Championship 2017, held by the lovely people at Clifton Coffee. It was my first barista competition and I just hoped I could get through the first round. The rules were simple – make a tasty AeroPress brew within eight minutes using beans supplied by Clifton Coffee alongside two other competitors. The coffees were then blind tasted by the judges, so it was all about the method of producing the brew – the coffee weight, size of grind, water temperature and volume, duration of steeping and extraction. Out of 27 entrants I came second and won a Silver AeroPress. I was so shocked – during the whole competition I didn’t expect to keep going forward through the heats, never mind win something! What’s the main difference in working in a coffee shop and working as a roaster and barista trainer? It’s less public facing with more behind-the-scenes work. It’s very interesting to look at it from a wider supply angle instead of one cafe’s point of view. How did you go from barista to coffee roaster and was it always your ambition to do that? Since I discovered my love of coffee I’ve been interested with each stage of coffee production, from growing, processing, exporting and roasting to craft the best taste to all the various extraction methods. I’ve wanted to learn about all aspects of production, and working at Moonroast was the perfect opportunity to further my knowledge. Since I’ve started here I have learnt so much from owner Francis Bradshaw about coffee tasting, roasting and dispatch. As well as learning more about coffee, I can keep my barista skills up to speed as we do barista training with all our customers to make the perfect coffee. For me, sample roasting and a cupping session is always sweet – tasting the different single origins and blends of coffee daily and having a play around with different brewing methods. I love meeting our current customers when I do barista training with the staff, either here at the roastery or in the cafes and restaurants that use Moonroast, talking them through making coffee and setting up the machines and grinders. It’s such varied work that it’s hard to pick one part. All sorts of places – cafes like Southsea Beach Cafe and Wags N Tales in London; delis like The Natural Deli in Bishops Waltham; farm shops like Applegarth in Hindhead and Newlyns in Hook; restaurants such as The Chesil Rectory and The Corner House in Winchester; gastropubs like The Hoddington Arms in Upton Grey, The Crown Inn in Upton and The Bugle Inn in Twyford. We even supply a cafe in the Saudi capital Riyadh! What is your own go-to coffee order? It has to be an AeroPress in the morning – it produces such a clean and easy cup. I normally produce a concentrated brew and add water to open up the flavours. What do you think makes a good coffee house? A chilled atmosphere where I can spend a couple hours with friends, or working on a laptop. I like to see a more wide-ranging coffee menu, a choice of single origins and brews but with something for everyone. I love to come across cafes that remind me of the passion for coffee that I discovered in New Zealand, and the standard of NZ coffee, brought over here.